In late 19th and early 20th century, Growlers in various forms were the way people took beer home before bottled beer was commonplace. You would take what was basically a bucket with a lid to your local bar and have it filled. How this pail earned its name as a “growler” is somewhat disputed. Whether it was the sound of the CO2 escaping from the pail lid or the response of a customer to a bar tender who only partially filled up their pail by leaving a thick head, the name stuck. Somewhere along the line they fell out of fashion and legality with the introduction of pasteurized bottling, automated plants, and local health departments. This was probably a good thing almost 100 years ago; however, today these are no longer a concern. The present day problem is that not all beer is produced in a quantity that makes bottling and distributing feasible for craft brewers to share with folks to enjoy at home. In 1989, Charlie Otto, owner of Otto Brothers Brewery, was posed with the problem of how to share small batch craft beer “to – go” and the modern day amber glass growler was born. Thanks Charlie! Over the last decade or so craft beer advocates have pushed for the legalization of the growler once again with proper sanitation procedures in place to protect consumer’s health and brewers reputation’s. 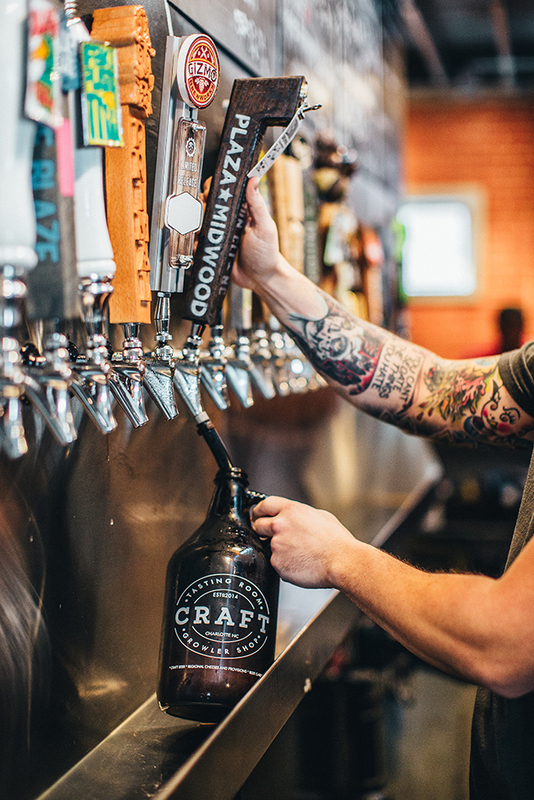 North Carolina officially joined nearly every surrounding state at the beginning of 2014 by legalizing the growler. Hurray for democracy! Craft Growler shop will fill any growler as long as you bring it in clean and it has the proper health warnings required by federal law printed on the glass. Growlers come in two sizes: 64 oz. and 32 oz. Once you buy a growler, you can refill it as many times as you want (Mother Earth thanks you). Unlike some shops, we will exchange any size “Craft” empty at no extra cost (i.e. 32 oz. and 64 oz. growlers are interchangeable). We sanitize your empty growler, purge the oxygen with a mix of carbon dioxide and nitrogen, and fill it with your new favorite tasty beverage. Your growler will stay fresh, quality unchanged, for weeks until oxygen is introduced. Once opened, you have about 2-3 days before the carbonation starts to diminish, kind of like a 2 liter. Don’t be shy about drinking your special brew, we’re eager to see you again, too. The freshness of a growler can’t be beat, but don’t take our word for it. Buy a growler of your favorite beer and taste it against the same beer from a bottle. You will be very surprised at the level of complexity your 12oz bottle was missing. Not to mention the enjoyment of all of the small batch and special release beers from your favorite brewers that you can now enjoy at home. Important : Once you have enjoyed your growler, please wash the container with soap and water and let it dry. If you bring us a container so dirty, it looks like a science experiment, we won’t be able to properly clean and sanitize the inside glass. Instead, you will need to purchase a new growler to maintain your GI tract, and keep the integrity of the brewers who have graced us with their creation. You can take home your experiment and tame it before bringing it back.